Footage and project files to work along with and refer to. Full versions of all tutorials in pin-sharp 1080P H264. Subtitle captions provided for all exercises (a suitable player eg.VLC needed to use .srt files). Email support if you have a question about the course. If you are working with Mocha AE (Adobe After Effects CC 2019) or have the Mocha Pro plug-in for After Effects, you have access to an extremely powerful tool. We use Mocha as a plug-in effect to create a number of common visual effects and fixes for problem footage. 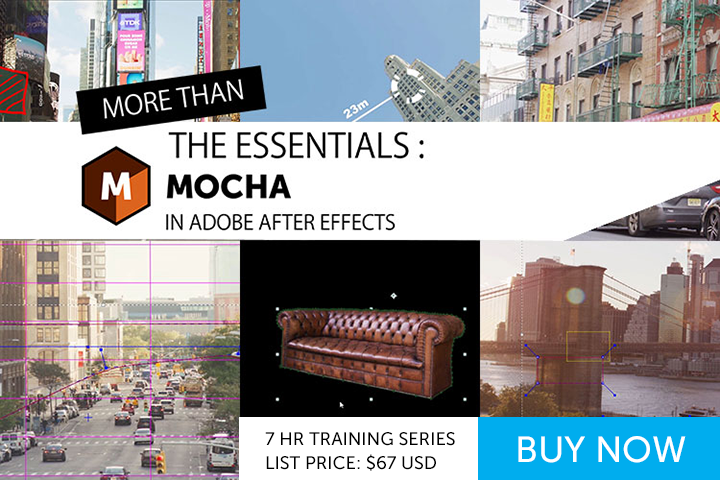 The aim of this course is to improve your skills in both Mocha and After Effects. Do It Right. Track Once. Use Often. The exercises start easily, analyzing shots to get the best motion tracking data. The next phase of the course looks at how we use this data with the plug-in version of Mocha. We work with match-moving and creating callouts, screen inserts, stabilization and rotoscoping to create masks. The final part of the course focuses on a real-world example that uses all of our newly learned skills and adds some more advanced elements to it. The course is structured so that ideas and techniques developed throughout the training. This deepens the learning and is more effective than a simple tour around the interface and features. This is not just button pushing. It is about building concepts and connections between the two pieces of software. About the trainer: Ben Brownlee has worked in production and post-production since 1999. In that time he has worked on a wide variety of film, television and commercial projects. As a trainer, he has worked with leading broadcasters and post-houses across the globe, providing bespoke training courses. He has also developed courses for renowned training providers such as Lynda.com and fxphd.com.